Alan Booth is an English writer who lived in Japan for about twenty years before passing away at the young age of 47 in 1993. I first knew about Alan Booth through my seminar professor, who recommended one of his books, when I told him about my travel adventures around Japan. Alan Booth did something similar, albeit a journey about a few hundred times more tumultuous and tedious than mine. He walked on foot from Soya in northern Hokkaido to Sata, the southern tip of Kagoshima, Kyushu in the space of four months. This incredible journey, somehow reminiscent of how pious Buddhists brave extreme weathers and flatten rugged terrains to India to seek enlightenment, was described in his book named “The Road to Sata”. Unfortunately, my professor did not have that book in his possession and so he lent me one of his other books called “Introduction to Japan”. The interesting thing is that, despite the seemingly amateurish title, it was actually written after “The Road to Sata”. Whilst there is little doubt in his credentials of writing such a book, I just felt he could have done much more than merely “introduce” Japan after walking the length of Japan, a feat probably unheard of among Japanese themselves. 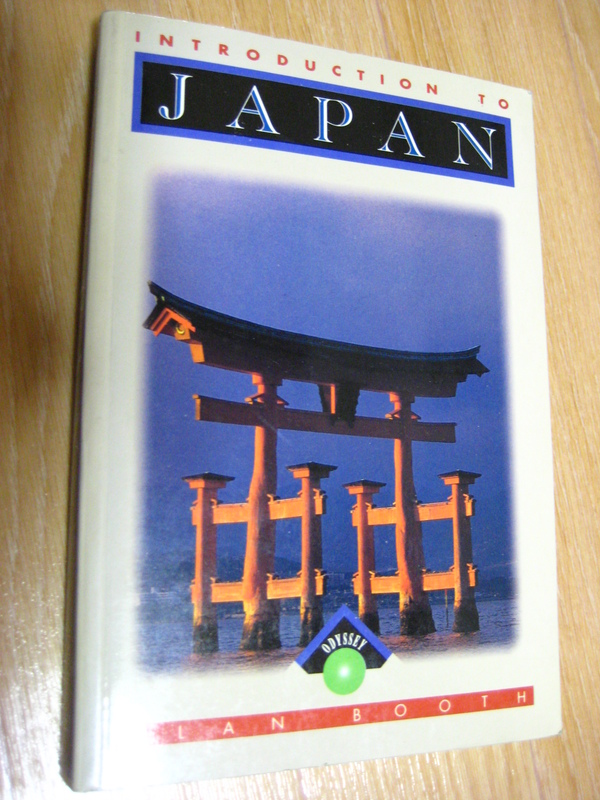 This book gives a relatively detailed (considering there are 47 prefectures to cover) account and description of each prefecture, each city, and famous festivals and events held in these places. Sandwiched between these accounts are quoted excerpts from historically famous foreign writers about Japan, such as Isabella Bird and Lafcadio Hearn. There are several limitations of this book, such as the out-datedness (this book was written in 1991, and the subjectivity and slight bias of the perspective he writes. However, of course, this subjective style of writing has somehow refurnished the old-fashioned look we have gotten used to. In fact, I was most drawn to the cynical and sarcastically humorous comments he made about Japan, its culture and people in this book. He starts off the book with the most accurate statement about Japan- “More thorough nonsense must be spoken and written about Japan than about any comparably developed nation”. In fact, Japan must have been the target of the most satirical comments from anthropologists, politicians and the general public in the world. Alan Booth mentioned about the helpfulness and kindness of Japanese which many foreign visitors to Japan have experienced, how Japanese are honest in returning lost items to train stations, and how taxi drivers turn off their meters and take time off work to cruise the streets looking for owners who have left their items in the taxis. The only exception and anomaly to this phenomenon he gave are filing income tax returns, and the stealing of umbrellas and bicycles. “No matter how much they cost and no matter how many combination locks protect them, it tends to be viewed as a fair game for anyone in urgent need of either”. He then brings up the topic of Kansai and the amusingly glaring discrepancy between Kansai and Kanto, and more interestingly, the difference between the two neighbours Osaka and Kyoto. He says “Osakans specialize in calling a spade a spade. Tokyo bureaucrats are more likely to call a spade an item of Earth-Realigning Equipment. The citizens of Kyoto would likely call one an Honourable Moon-in-the-Water-Stirring Altering-of-the-Ineffable-Landscape Device. No two neighbouring cities could offer a greater contrast in the mechanics of voice production than do Kyoto and Osaka- the cultivated, gently sibilant birdlike tones of Kyoto, where the men all sound disturbingly like women, and the throaty chin-thrusting rasps of Osaka, where a lot of the women sound disturbingly like men and the men sound like bulldozers. He also mentions about Mt. Fuji, about how it is foolish not to climb it at least once in your life, but equally foolish to climb it more than once. His chapter on Hiroshima and world peace was thought-provoking as he displays the largely unseen side of the argument about the atomic bomb dropped on Hiroshima. With all the hype about Zen Buddhism and Shinto ingrained in the various everyday practices and cultures of Japan, he suggests seeing certain Japanese arts, say, Kyudo (archery), as a practical embodiment of Zen, which essentially means that “an archer who failed to hit the target after repeated tries could declare his interest to be spiritual, and thus above such mundane ambition”. I believe what his saying is true…but I also believe that if he had been a Chinese or asian foreigner in Japan…things might have been very different for him…. Sometimes…I am happy that I have an English name…and not Chin Chong Chinaman name…cause I know…the discrimination behind that….